I am fortunate to teach in a school where each classroom has a SMARTboard – an interactive white board mounted to the wall. I’ve challenged myself to find ways to use this technology tool to engage my students and move beyond simply using it as a projector screen or a digital worksheet. This is the fourth year I’ve had access to an interactive whiteboard and I’m continuing to learn so much from my colleagues, my students, a few workshops and simply playing around with the tools. Here are just a few ways that I use my interactive whiteboard in our classroom. Every day I write a morning message in the form of a letter on the SMARTboard for us to interact with. I write one sentence per line in alternating colors so children can easily see different sentences. We read the message first, then fill in any missing words I left out for kids to write, read the message again to make sure it makes sense, looks right and sounds right, and finally use a variety of tools to highlight specific words, letters, punctuation, etc. Kids come up to the board to show us what they notice. For example, they may use the Magic Pen to spotlight a new sight word from the word wall. The highlighter pen is a favorite tool to highlight letters and words they know, as well as ending punctuation they are noticing. I may include a graph for kids to move their names to indicate what they would like for lunch on an upcoming field trip or what their favorite color is. All students have a traditional lap whiteboard of their own to follow along with what is happening on the SMARTboard. I find this helps keep all kids engaged and allows me to do a quick check of who is “getting it” and who needs additional support. I print one copy of the morning message before we interact with it. Then I print another copy when we are done that shows all the thinking and writing we have done. I then make a 2-sided copy to send home. This is the only homework I send home for my kindergarteners. Their job is to share the morning message with a family member and do the blank side with someone. Many of the kids “play school” with other siblings or their parents and they tell me they enjoy sharing the message at home. They do not return this to school. I ask families to save these at home in a notebook or folder for kids to revisit and read as the year goes on. It provides another text for kids to read and reread at home. We’ve done several projects focusing on visual art this year with the SMARTboard playing a key role in our unit. 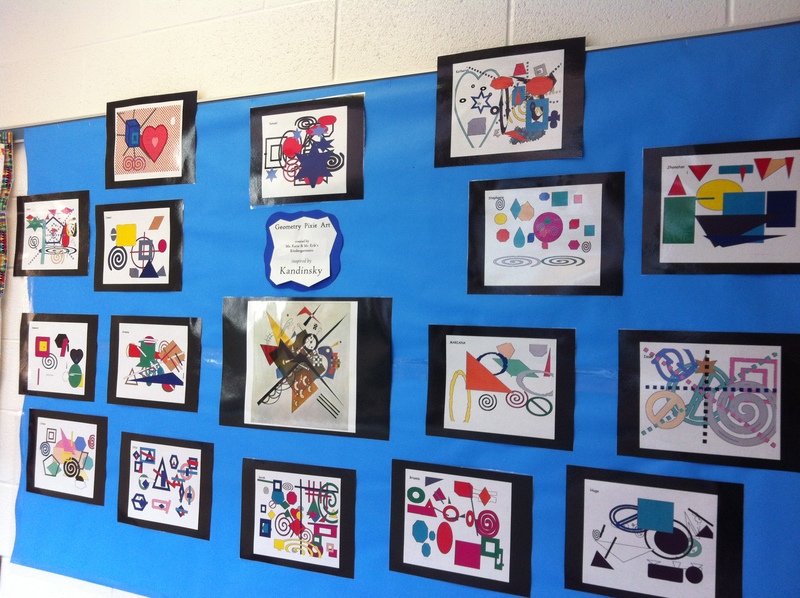 We used Kandinsky’s art to learn about geometry and recently we explored the alphabet through photographs. The children looked at alphabet posters on the SMARTboard and found the letters in the photographs. This was a station where kids could look at a variety of photographs and highlight the found letters with a variety of writing tools. We then went out and took our own alphabet pictures and are in the process of editing them into a slideshow and a poster like the ones we have studied. 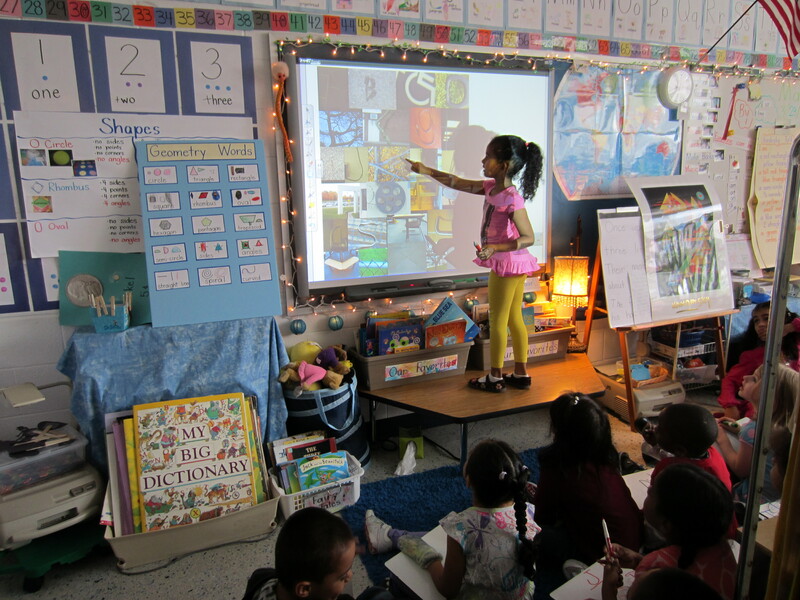 I love how the SMARTboard can allow children to see the art and interact with it. 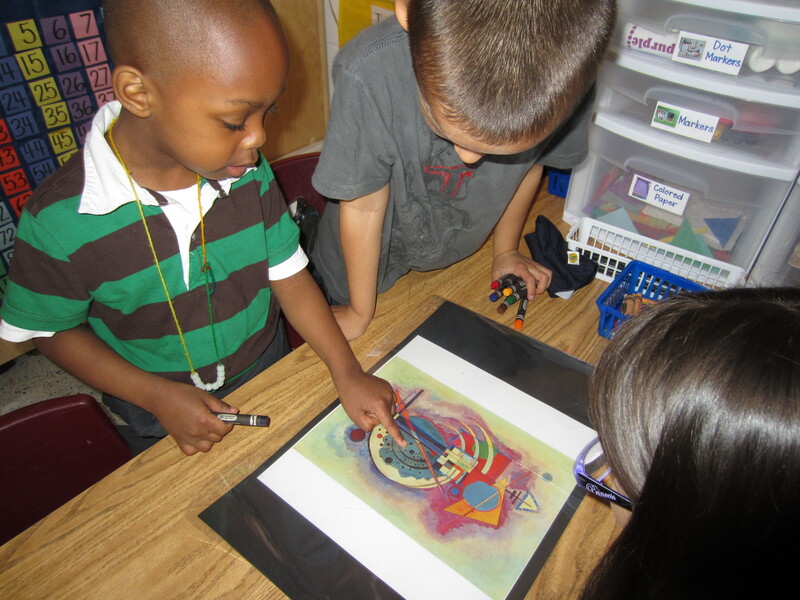 We have looked at a variety of art in math, science, social studies and language arts. With the SMARTboard the children have been able to experience the art as they write on it, trace over it, spotlight it, create their own and interact with it beyond what we can do with an art print. There are many art museums that allow you to download pictures of the art and save them. Google images also has many possibilities for images to use while teaching. We use our SMARTboard not only to view and comment on class blogs that we follow, but also to create new posts on our class blog. We can do a shared writing piece with everyone participating as we create text to share on our blog and choose the accompanying photos. Recently, a student went to visit her grandparents and missed a week of school. She kept in touch with a blog. We looked at her blog every morning and commented on the posts she was writing. We’ve created several VoiceThreads this year and can use the SMARTboard to create, view and add new comments to existing VoiceThreads. 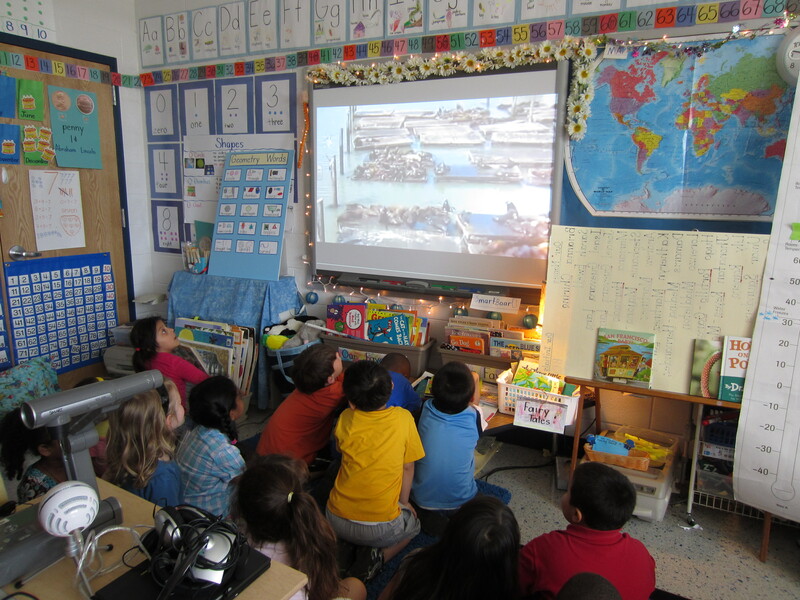 We’ve shared favorite books, read a community writing piece and reflected on a field trip through VoiceThread. We also tweet on the SMARTboard – reading through our Twitter account and adding new tweets to our friends in other schools. With an interactive whiteboard you can use screenshots from videos, YouTube clips, photographs, etc. and create with writing, drawing and audio right on the image. Recently the space shuttle Discovery flew over our school on its way to the Udvar-Hazy Center near Washington, DC. The kids were so excited to see this and wanted to learn more. I found clips of the space shuttle launch online, as well as a collection of photographs. I put them on the SMARTboard and the kids interacted with them, (while also using a collection of books I got from the library) – labeling parts they knew, circling parts they wanted to learn more about, creating a dialogue with the audio tool to talk about what they saw and what they still wondered about. 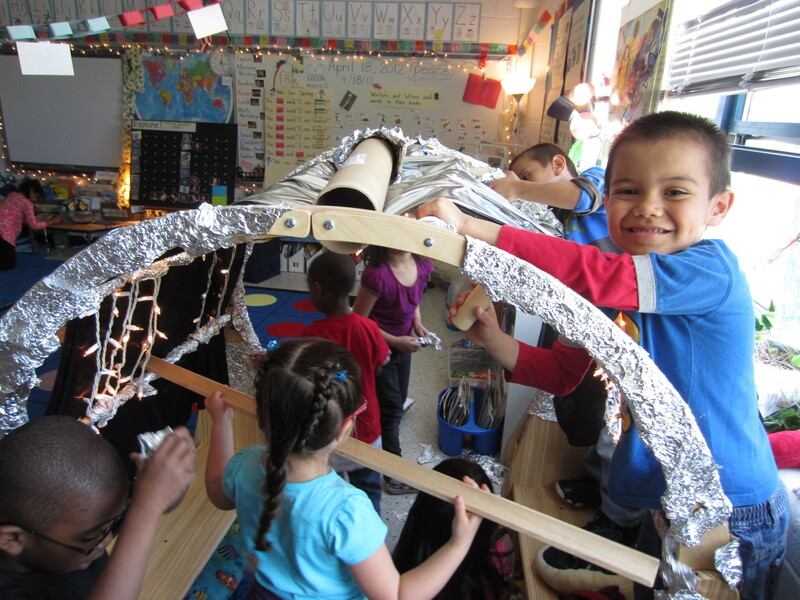 Then they decided to build their own space shuttle in our classroom (with a LOT of aluminum foil!). This became a dramatic play area for a few weeks. I feel like I learn and discover something new almost daily with my SMARTboard. We use it with Scribble Maps to draw on maps as we learn about geography to track the migration of monarchs, find a location from a book or to find where a Twitter friend lives. We use it with Pixie to model a visual representation of our thinking while sharing a math problem. We use it to practice concepts by sorting rhyming pictures or creating graphs for students to interact with. The possibilities are really endless! One thing I feel strongly about, however, is that it’s not a replacement for shared writing on chart paper or a community writing book project. It can’t replace shared reading with big books or poems on charts. It’s a great resource to complement my teaching and I make sure my plans for using it have a specific purpose. I don’t use the SMARTboard for everything I do. I still use big books and highlighting tape for shared reading – but I may do a shared reading occasionally on the SMARTboard too if the text I want to use lends itself to being projected and used on the board and will benefit the kids this way. I view the SMARTboard as a tool FOR my students. It’s not just my board – it’s theirs too – that’s why it’s called interactive. I want them to use it independently, interact with it and be proficient with this tool. I see the interactive white board as another tool to engage my students. I recently read a great book published by Stenhouse called Literacy Smarts by Jennifer Harper and Brenda Stein Dzaldov. The authors share simple, yet meaningful, strategies for using an interactive whiteboard in your classroom. If you’re looking for more possibilities in using your interactive whiteboard, I highly recommend this book. 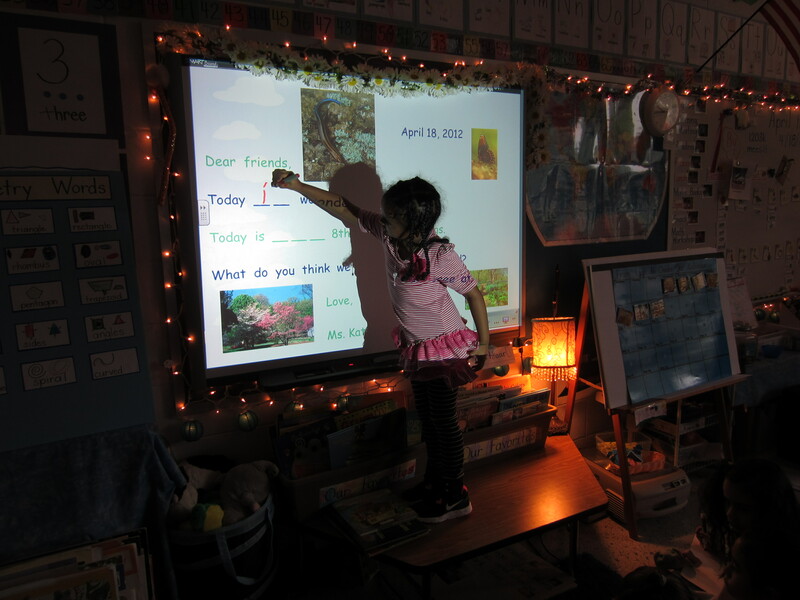 How do you use your interactive whiteboard in the classroom? We’d love to hear your ideas!